Somerset recorded back-to-back victories in the Specsavers County Championship with a comprehensive victory over Nottinghamshire at Trent Bridge. Jack Leach recorded figures of six for 36 as Notts were bowled out for only 126 in their innings, giving the West Country side victory by an innings and 14 runs. Jack Brooks, who had taken the first two wickets to fall on the second evening, returned to close out the contest and ended with four for 22. Continuing from their overnight position of 25 for two, the home county resumed with Ben Slater and nightwatchman Luke Fletcher at the crease. The pair eased their way against pace during the opening hour of the session but were undone by the introduction of spin. Called upon for the first time in the match, Leach needed only six deliveries before striking. Slater, shortly after the 50 partnership had been brought up, was tempted to push forward and was smartly stumped by Steven Davies for 34. The England international then bagged another wicket a couple of overs later, turning the ball sharply to bowl Joe Clarke for two. 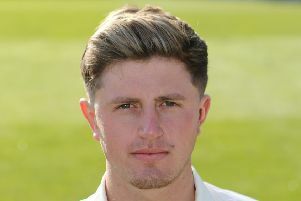 Leach extended his figures to three for eight with the scalp of Fletcher, who faced 78 deliveries for his 21, before hoisting the ball out to Craig Overton at cover. 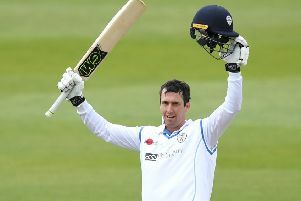 Davies claimed his second stumping of the day, soon after lunch, with Steven Mullaney dragged forward by the simmer, who then had Tom Moores sharply taken at short leg by Marcus Trescothick. The same fielder moved to short midwicket to bag a simple offering from Luke Wood, off Brooks, leaving the hosts on 120 for eight. Samit Patel, who had missed part of the previous day’s play attending the birth of his new baby daughter, had briefly tried to mount a counter-attacked but was then given out lbw to Leach for 24 and the end came when Stuart Broad hoisted Brooks into the hands of Azhar Ali at long leg. The victory, Somerset’s seventh straight win over Notts, earned them maximum points to become early pace-setters in Division One. Their next opponents in the County Championship are defending champions Surrey in a month’s time. Nottinghamshire haven’t won any of their last 10 first class matches, a sequence that goes back to their victory against Essex at Chelmsford, the same opposition and venue where they will resume after the break for the Royal London One-Day Cup matches.